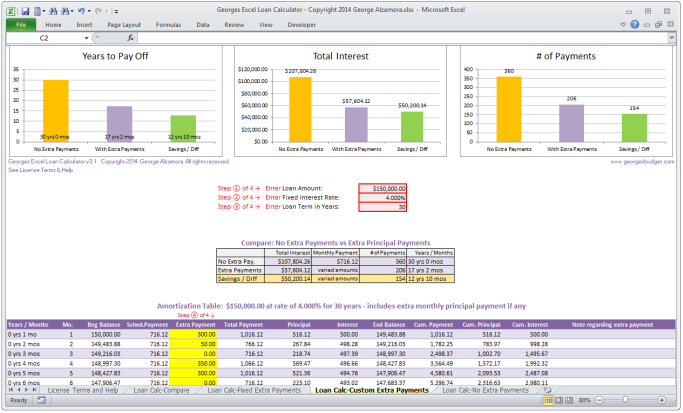 Excel template mortgage home loan calculator with additional extra principal payments. Simple to use home loan mortgage calculator in an excel template format. Georges Excel Mortgage Loan Calculator includes amortization table and ability to add additional principal payments to see whether or not you want to pay of mortgage early by making extra principal payments each month. Excel mortgage calculator to calculate monthly monthly payment based on mortgage loan amount, interest rate and term whether its a 10 year mortgage, 15 year mortgage or 30 year mortgage. Refund Policy: Due to the nature of digital downloads, and that they can not be physically returned, there are no refunds, no exchanges, and no cancellations.